Back in May, what seems like ages ago, I took a class with Mandy Leins in which you would make an abstract quilt from a photograph. Before I even signed up for the class, I knew what I wanted to make. 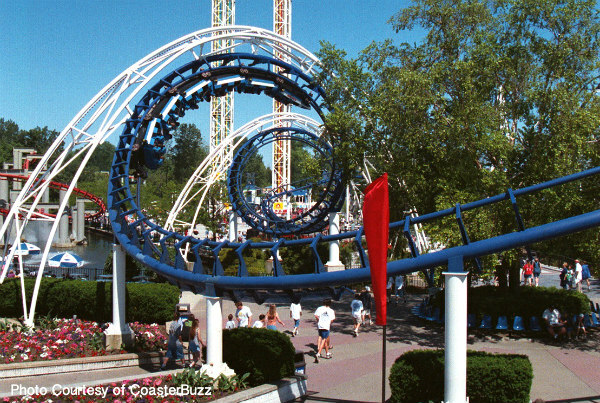 This is a photo of Corkscrew, a rollercoaster at Cedar Point Amusement Park in Sandusky Ohio. The park holds a special fondness for my husband and me (we got engaged there) but it also happens to be the park where my husband's best friend, Kara worked as a ride operator for Corkscrew back in the late 1990's. Little did she know that more than a decade later, a chance sighting during a Disney marathon would lead to her reconnecting with one of her fellow Corkscrew coworkers, that they would fall in love and get married. So, what better way to celebrate their marriage than with a quilted wallhanging of the ride where they first met. I wanted to keep it rather abstract, but I'll be honest, I really struggled on how to quilt this, especially the upper section. 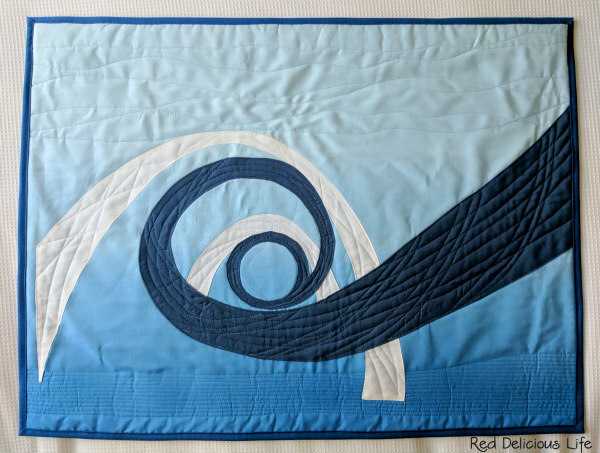 I had to resist the urge to just straight-line quilt the entire background but I wanted to keep it a bit more minimal. You'll have to forgive some of the wrinkles in the photo below. In truly rushed fashion, I forgot to take some good photos and my husband took this one with his phone in our hotel room before it was pressed one last time and wrapped. 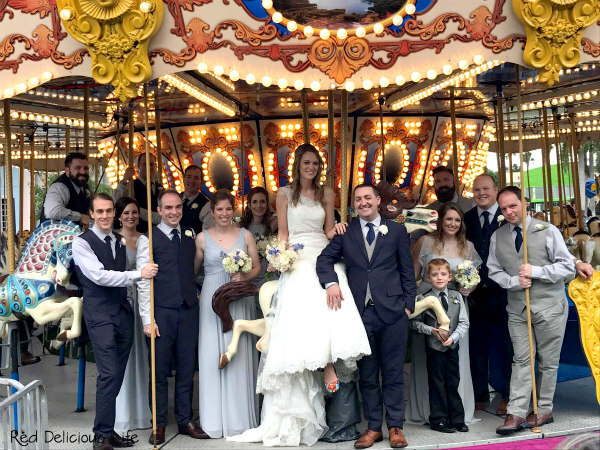 Their wedding was last weekend and had a vintage resort vibe to it, set in a seaside Florida locale, and while there wasn't a rollercoaster anywhere to be seen, there was a beautiful carousel which provided a beautiful backdrop for some photos. My husband and son were both in the wedding. They are the 2 on the right. I think they clean up well. 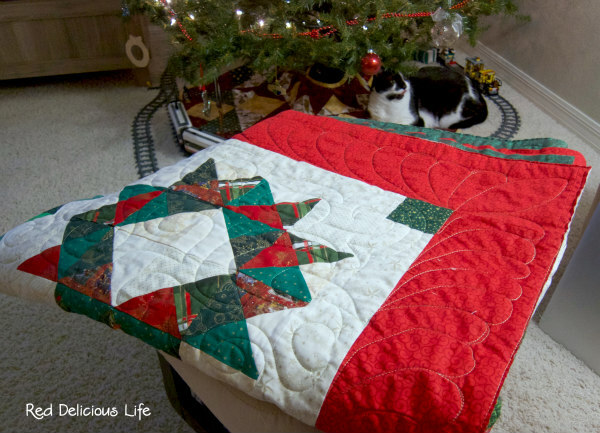 The couple loved the quilt and I look forward to seeing it hang in their new home that will be just a few miles from us. This was my final project that I was able to get done this quarter for the 2016 Finish Along. There's nothing more satisfying than finishing a quilt, but when it's a bee quilt that turns out even better than you hoped, it's the icing on the cake. And what's even better is that it's done in time to snuggle under this holiday season. 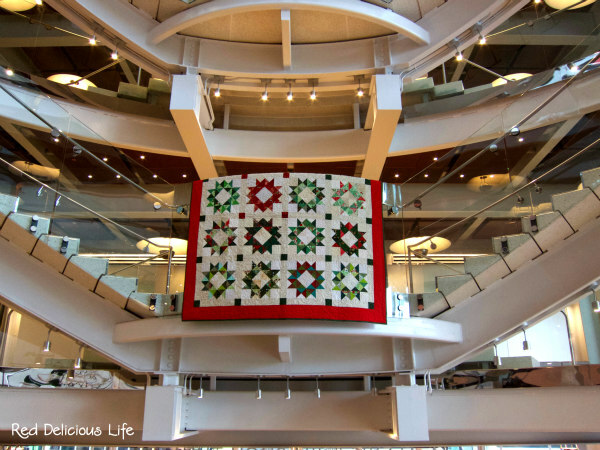 As with all of my quilts, I brought it to the performing arts center where I work for a fun little photo shoot. 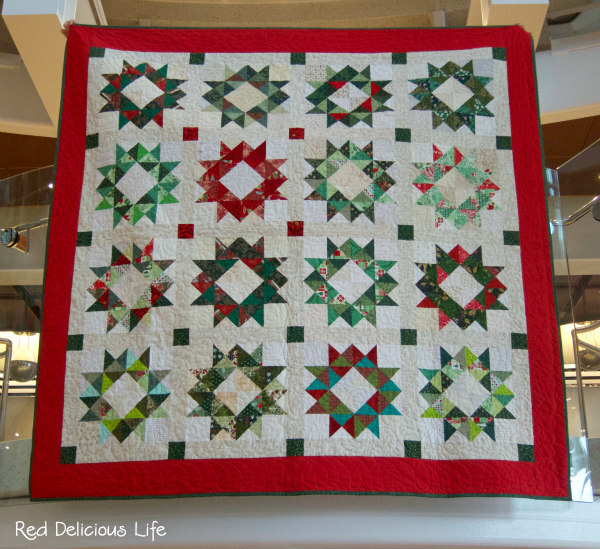 This week's production was the Nutcracker Ballet so it was fitting that I had a holiday quilt to photograph in the lobby. I just love how we have a large glass circular grand staircase with stairs on both sides that wind their way up 5 stories high with balconies at each tier. 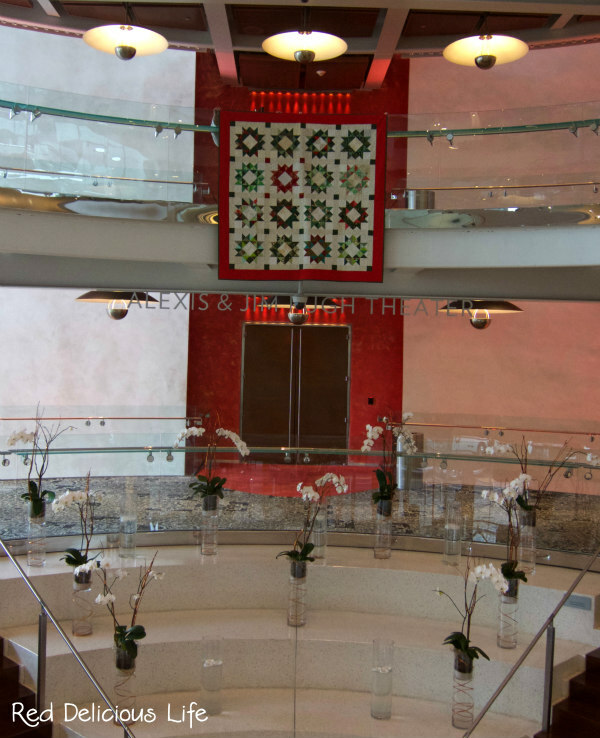 The photo below is with me on the 2nd tier and the quilt hanging over the 3rd tier balcony. You can see the entrance to one of the theaters. (The quilt completely hides the doors on the 3rd tier.) I know the quilt looks rather small but I was determined to get the orchids into my photo. This was my StashBee Quilt this year. 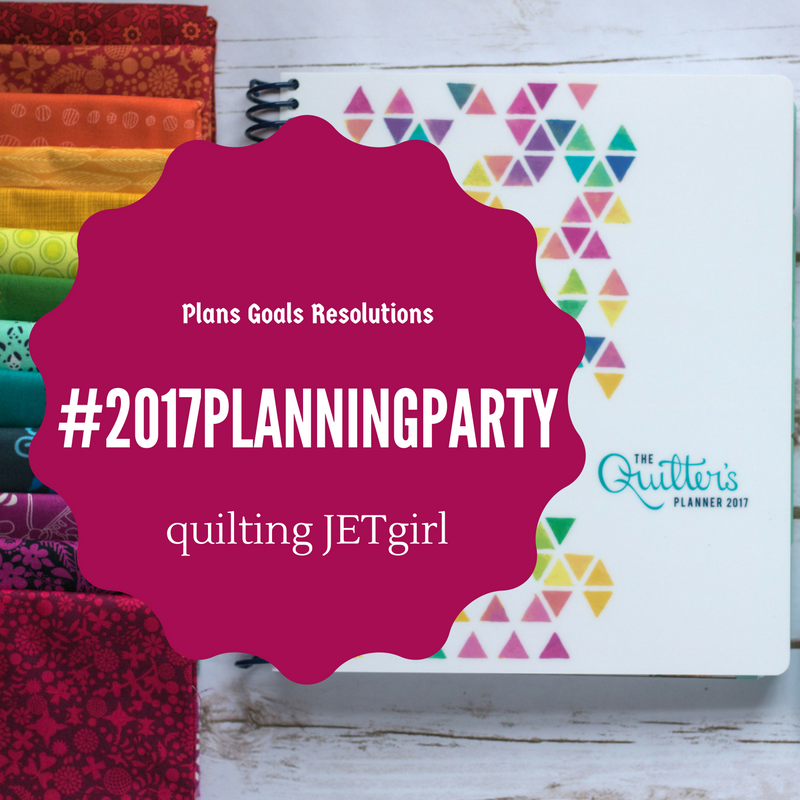 It's done just in time for me to start on a new one for 2017! This finishes out my last one monthly goal for December and marks another item off my 4th quarter 2016 finish along list. linking up to the December OMG linky party here.